Start using the Symfony CMF in 10 minutes! This quick tour will walk you through the base concepts of the Symfony CMF and get you started with it. It's important to know that the Symfony CMF is a collection of bundles which provide common functionality needed when building a CMS with the Symfony Framework. Before you read further, you should at least have a basic knowledge of the Symfony Framework. If you don't know Symfony, start by reading the Symfony Framework Quick Tour. Before starting a new project, there is a difficult decision on whether it will be based on a framework or on a CMS. When choosing to use a framework, you need to spend much time creating CMS features for the project. On the other hand, when choosing to use a CMS, it's more difficult to build custom application functionality. 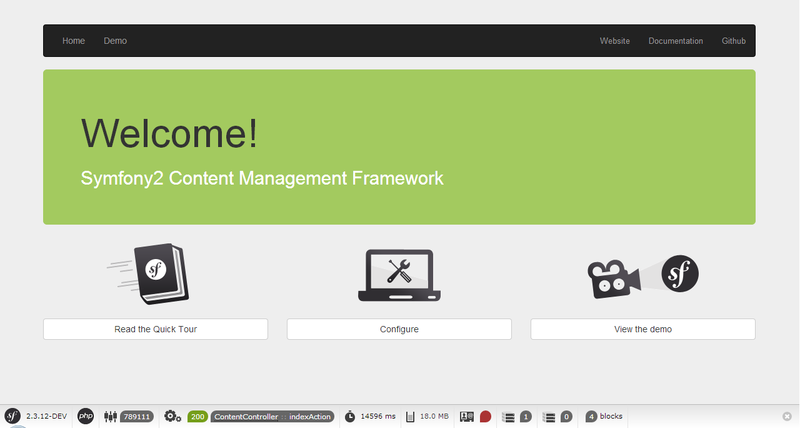 It is impossible or at least very hard to customize the core parts of the CMS. The Symfony CMF is created to solve this framework versus CMS dilemma. It provides Symfony bundles to easily add CMS features to your project. Yet, as you're still using the Symfony framework, you can build any custom functionality you can think of. This flexibility is called a decoupled CMS. The bundles provided by the Symfony CMF can work together, but they are also able to work standalone. This means that you don't need to add all bundles, you can decide to only use one of them (e.g. only the RoutingBundle). To explore the CMF, it is best to download the Symfony CMF Sandbox. The sandbox contains demonstrations for many of the CMF features and is a good playground to familiarize yourself with the CMF. When you want to start an actual project with the CMF, best download the Symfony CMF Standard Edition. The Symfony CMF Standard Edition is similar to the Symfony Standard Edition, but contains and configures essential Symfony CMF bundles. Now, the only thing left to do is setting up the database. This is not something you are used to doing when creating Symfony applications, but the Symfony CMF needs a database in order to make a lot of things configurable using an admin interface. You are going to learn more about the Database layer of the Symfony CMF in the next chapter of the Quick Tour. Use the server:run command to run a local server for the demo. Running a CMF application is the same as running any Symfony application, see Configuring a Web Server in the Symfony documentation. First of all, you see a typical Symfony request flow following the white blocks. It creates a Request object which will be passed to a router, which executes the controller and that controller uses models to generate a view to put in the response. On top of this, the CMF adds the green blocks. In the coming sections, you'll learn more about these separately. Before creating the CMF, the team had done a lot of research on which database to use. They ended up finding JCR, a Content Repository for Java. 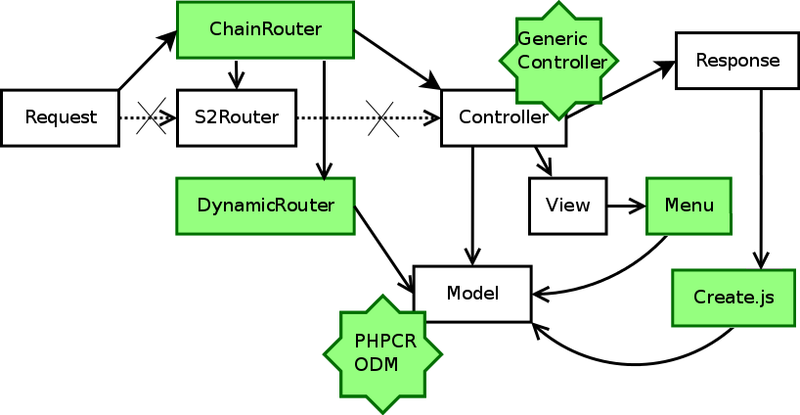 Together with some other developers they created PHPCR, a PHP port of the JCR specification. PHPCR uses a directory-like structure. It stores elements in a big tree. Elements have a parent and can have children. Although PHPCR is the first choice of the CMF team, the bundles are not tied to a specific storage system. Some bundles also provide ORM integration and you can also add your own models easily. In Symfony, the routes are stored in a configuration file. This means only a developer can change routes. In a CMS, you want the admin to change the routes of their site. This is why the Symfony CMF introduces a DynamicRouter. The DynamicRouter loads some routes which possibly match the request from the database and then tries to find an exact match. The routes in the database can be edited, deleted and created using an admin interface, so everything is fully under the control of the admin. Because you may also want other Routers, like the normal Symfony router, the CMF also provides a ChainRouter. A chain router contains a chain of other routers and executes them in a given order to find a match. Using a database to store the routes makes it also possible to reference other documents from the route. This means that a route can have a Content object. You'll learn more about the router further in the Quick Tour. When a Route matches, a Controller is executed. This Controller normally just gets the Content object from the Route and renders it. Because it is almost always the same, the CMF uses a generic Controller which it will execute. This can be overridden by setting a specific controller for a Route or Content object. Using the RoutingBundle, you can configure which Content objects are rendered by a specific template or controller. The generic controller will then render this template. A view also uses a Menu, provided by the KnpMenuBundle, and it can have integration with Create.js, for live editing. Now you know the request flow, you can start editing content. While the normal usage will be to edit content through a web interface, the CMF sandbox also supports loading content from static files. This is mainly useful for testing purposes. The fixtures are loaded with the doctrine:phpcr:fixtures:load command. To edit the home page, edit the first entry in src/AppBundle/Resources/data/page.yml to say something different. Then, run the doctrine:phpcr:fixtures:load command to get the changes into the content repository. After refreshing the browser, you can see your modifications! Don't worry, editing fixture files is only done for developing and testing. The CMF comes with a Sonata admin integration for convenient online editing, or you can build your own editing systems. Congratulations! You've come to the end of your first introduction into the Symfony CMF. There is a lot more to discover, but you should already see how the Symfony CMF tries to make your life as a developer better by providing some CMS bundles. If you want to discover more, you can dive into the next section: "The Model".